Picture this: it's 98 degrees Fahrenheit and climbing; you're 65 feet up in the air, outside an airfield control tower on a three foot wide balcony; no water, no gaffer's tape, anchored there for the next three and a half hours. You could have been an accountant, but oh no - you chose to be a videographer! "What doesn't kill you makes you strong," they say; to which I'll add "and teaches some good lessons along the way." VideOccasions, the production company my wife Judy founded in 1998, was approached by the Olympic Flight Museum, located just outside Olympia, the Washington State Capital, to produce a commercial DVD of the 6th annual Warbirds Air Show - three hours of flying on each of two days - with static displays of military aviation, historical flying gear and the various accoutrements of six wars since 1914, all pretty much in working condition. contribute to the operation and maintenance of the museum and its aircraft, in exchange for getting to play with some pretty impressive toys, including a beautifully restored P-51, a Cobra helicopter and a Japanese Zero! We began work on the project in early May for a mid-June shoot by suggesting to Teri Thorning, Executive Director of the museum, that she and her staff of volunteers put together an outline - a very loose storyboard -- of what they wanted shot, and what they wanted as the focus of the DVD. This proved impossible: "We're airplane people," the volunteers said. "You do the video, we fly the planes." This is often what we find when working with a large-scale event: sponsors know they want a video record but have few specifics and virtually no understanding of the process involved in creating a good video production. What we were able to learn about the event from speaking with Teri was that this was the sixth year for the event; that three to five thousand people would attend each day and that well over one hundred aircraft would be on hand, most flying to the site the day before the show. Planes, helicopters and a Bradley fighting vehicle would be spread out over several acres of tarmac parking pads, flight line and taxi-ways, the museum hanger would be turned into a huge merchandizing area and Teri, who was organizing it all, already had a sign on her desk which read "Don't talk to Teri unless you're on fire!" In the absence of a storyboard, we approached the project with a plan to document everything we could during the two days of the show, with relatively little idea of how all this footage would be edited into a coherent story. Unlike a wedding, where the traditional aspects of the event create the storyboard - e.g., the bride gets dressed, has her gown zipped up, meets her father and walks down the aisle, etc., -- many events, the air show among them, are without formal structure. For the air show, structure was replaced by a list of things that the client wanted shown: the regional airport and the State Capital grounds from the air and from the ground; the museum store and museum-owned aircraft; static displays of aircraft and war memorabilia; vendor's and sponsor's booths; the flight of numerous aircraft and, if possible, interviews with participants. 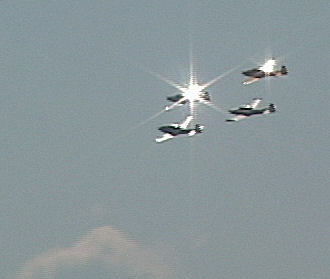 Our job would be to create a structure that would tie these into a story of the air show. We arrived at the air field early Saturday morning, were issued passes that provided access to every part of the air field and, since we weren't on fire, spent the next couple of hours without Teri, exploring the site and shooting the exterior of the museum building, the scenery around the site, signage associated with the museum and the air show, as well as some of the early morning preparation for the show. The weather was clear; the sky dotted with huge cumulus clouds, the sun dazzling. The thermometer stood at 83 degrees at 9:30.
many classic War Birds at the Air Show opposite each other: a cut from one camera to the other would "cross the line" - that is, a plane going from my left to right would be flying from Judy's right to left. A second problem was that although the flight of each aircraft lasted anywhere from ten to twenty minutes, much of each flight would be out of camera range as aircraft banked, turned and gained altitude away from the field. For the DVD, the performance of each aircraft would be reduced to highlights of acrobatics and to low level passes, perhaps three to five minutes per flight. We would have to shoot in such a way that we could compress performance time without obvious jump cuts, digital transitions and other awkward editing necessities. To demonstrate the characteristics of each aircraft we thought it essential to have footage of the take off and landing, as well as of fly-bys and aerobatics activity. To enable smooth editing we agreed upon shooting criteria: always to allow the aircraft to pass out of frame, regardless of whether on the runway or aloft; to let the exit-out-of-frame occur, in so far as possible, as the plane was climbing; and to frame shots that showed a plane against clouds or against the backdrop of the trees at the end of the runway, rather than against the jumbled background of hangers and aircraft on the flight line or in a clear blue sky. This criterion was important: the clouds and trees provided a sense of depth to the shots impossible to attain against the empty blue sky. Finally, we reminded ourselves to use a shooting strategy that we've used many times before: if you shoot someone walking toward you, let them walk out of frame, then turn around and shoot them as they walk away from you. This enables excellent continuity in cutting, as well as providing for the compression of time and distance. To address the problem of "crossing the line," we decided to devote much of Sunday to getting cut-away shots during the flight performances, shots of spectators who appeared to be watching aircraft coming from both left and right. This strategy paid off when we started editing, and points to an important aspect of the cut-away shot. Nicolo Machiavelli, the cynical 16th century Italian political philosopher, asserted that it is not important that a Prince be righteous, merely that he appear to be righteous. Of the cut-away it may be said that it isn't necessary that the shot be related to the moment, only that it appear to be related to the moment; that the focus, the total concentration of the subject in the cut-away, appears to be on the event. 1. The shot from Camera "A" records the action as seen by my camera on one side of the runway. An aircraft is coming from right to left. 2. We see a spectator, on Judy's side of the runway, looking off to the left. In one cut-away that we used a woman was actually looking at her young daughter, who was out of the shot. What mattered was that the woman was sitting on the ground, looking left, with her line of sight at about where the aircraft would have been. 3. The shot from Camera "B," on Judy's side of the runway, is of the aircraft coming from left to right. 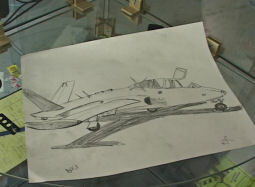 The viewer understands that we are now seeing the aircraft through the eyes of the spectator. We have successfully crossed the line, using the spectator as the pivot point. Meanwhile, back at the shoot . . .
By noon Saturday, when I headed for the control tower, the temperature was above 90 degrees and climbing. It would top one hundred degrees by late afternoon. Because of the heat and the fact that I would be shooting on battery, I chose to leave my heavy grip bag in the hanger office, taking only camera, tripod and spare tapes onto the tower. This turned out to be a major mistake: I left my water bottle and roll of gaffer's tape inside the bag! I soon found myself on the narrow observation balcony just below the top of the control tower, with scarcely any room in which to open the tripod. In the absence of gaffer's tape I tore my handkerchief into strips and lashed two of the tripod legs to the balcony railing. The third leg I pulled back and wedged into a crack at the base of the wall. I spent the next three hours straddling that wedged leg! Despite the awkwardness of this arrangement, with my back against the control tower wall, I found I could still cover a nearly 180-degree field of fire. A quarter mile away, on the other side of the runway, Judy had abandoned her tripod in favor of going hand-held. She was so close to the line of flight that it proved impossible for her to follow rapidly moving aircraft with the camera on the tripod. At ground level, her biggest problems throughout the afternoon would be dodging the crowds to get a clear shot of aircraft on the runway or making low-level passes, and getting to her water bottle from time to time. 4. Three 30 gallon black plastic bags for emergency rain covers, seats on wet grass, covering windows, etc. from the heat. The lesson learned was the importance of what I now think of as my "grab" bag, a grip bag small enough to take anywhere -- literally to grab-and-run. The contents of mine are shown in the table above. I restock the contents of this bag every time I return from a shoot! Now, where my camera goes, the bag, a small backpack, goes as well. The show began with a parachute jump from eight thousand feet, the jumper bringing in a thirty-five foot wide American flag rigged on a line below him. He exited the plane behind me, out of my line of sight, and drifted toward my front. I removed my camera from the tripod and finally located him in the viewfinder when he was about 1,500 feet above the ground. If I hadn't hit upon a strategy that served me the rest of the afternoon I never would have found him at all. Looking away from the viewfinder I located an object on the ground - a tree, in this instance - that was on a line with the jumper. In the viewfinder I located the tree, then tilted up until I located the target. It only took three tries and about 800 feet of altitude for success! Just before the first flight of the afternoon - a Russian Yak-55 executing a series of high-performance aerobatics - one of the FAA controllers joined me on the balcony, volunteering to be my spotter. He had seen the practice flights the day before and had an idea of where the various planes would enter and depart the "box" of space allocated for the air show performances. I can't stress enough the importance of this volunteer. Unlike Judy, who had a 360-degree field of vision, the control tower wall limited mine to 180 degrees. Once a plane passed overhead behind me, I had no way of determining where it would next appear. I'm convinced that having a spotter should be an integral part of any event shoot. It isn't always economically feasible, but it makes a world of difference in the quality of the shoot. With eye glued to the view finder, a lot goes unnoticed by a videographer. At a recent birthday party for a three year old, I spotted for Judy in a chaos of pony rides, peddle cars, trampoline bouncing, two dogs, a cat and fourteen parents. Shooting alone, she would have missed half the shots she was able to record, simply because she would have been too busy with the ponies to see the cat eating the cake or the shy kid hiding under the table. Even with the help of my spotter, acquiring the aircraft targets was a challenge. The solution was to acquire the aircraft wide open, then zoom in to the tightest shot that permitted tracking. Once acquired, keeping the target framed presented problems as well. At a 12X zoom, the slightest movement of the camera was magnified tremendously. Shots directly into or away from the camera were easiest to track. A simple tilt up or down keeps the plane centered. It's the horizontal crossing that's difficult. Even with a good pan head, panning while attempting to keep an aircraft in frame and with adequate lead-space is a real challenge. A twelve-inch monitor would have been helpful in this situation; it was often difficult to find the target in the camera's flip-out viewer and virtually impossible using the black and white viewfinder. Freed from the constraints of the tripod, Judy found it much easier to acquire her targets and to follow them through the arc of their flight. She handles the PD-150 very well, having used it hand held for fifteen continuous days shooting in China and on numerous other event shoots. Some of her footage was shaky, of course, but most was quite useable. Monopod fully extended, braced against body and leg. On Sunday, shooting pick-up shots, I used a combination that works well for me, a Bogen 3245 monopod and 3229 tilt head, with a Videosmith Mightywondercam shoulder mount attached. I've found that by putting one leg over the extended monopod - in effect, hooking it behind my knee -- and pulling the back of the mount into my shoulder I can get a very solid shooting platform. 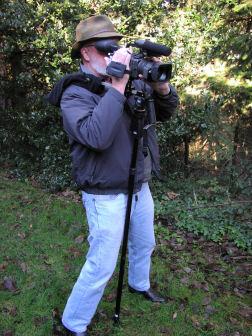 A squeeze on the monopod handle and the rig is short enough to enable moving on for the next shot. This setup enabled me to move freely among the crowd while getting the candid shots I needed for cut-aways. I've used this rig for many other event shoots as well, and have found it works well in most situations where mobility is important. Judy, meanwhile, got to go aloft for three aerial shoots, in a Russian Yak-11, a WWII Grumman TBM-3E Avenger torpedo bomber and with the Fraser Blues, a close formation Canadian flying team that performs in classic Navions, which were originally built as Marine light reconnaissance aircraft. The Yak-11 and Avenger, while providing exciting rides, had cockpits too confined for much good camera work. To shoot from the Yak-11 Judy had to remove the on-camera mic so it wouldn't bang into the canopy, hold the camera above her head at a right angle to her body, point it outboard and down toward the earth below and hope for the best since she couldn't see either viewfinder. Remembering to improvise while shooting is an important asset for every videographer. The Navion has a side-by-side seating arrangement that permitted excellent shots of the take-off and landing, as well as aerial shots of other planes in the formation, the pilot and cockpit,and shots of the airfield, surrounding countryside and the State Capital grounds. The Steady-Shot feature of the PD-150 worked wonders and there was surprisingly little jitter caused by the aircraft vibration. Weeks before the shoot we debated at length what to do about audio for the DVD, at first deciding that we would use a narrator to describe the action and perhaps use WW II music in the background, with occasional aircraft sounds thrown in. Saturday night, however, after a day of hearing the roar of the aircraft and the unique sound signature of each, and the echoing boom of the public address announcers, we decided to record the commentary from the public address system on Sunday, and to use as much of this as needed along with the ambient sounds of the flight line, aircraft aloft, and the crowds of people as they wandered through the grounds. No voice over, and no music bed. We were unable to get a line feed from the PA system, so we decided to position one of the cameras near the speaker tower during the Sunday air show to capture the PA audio. In retrospect, we would have been better served by having a dedicated recording device for this purpose; a mini disc, DAT or even an analog tape would have provided greater consistency than the camera. Every time the camera mic moved off axis as the camera moved to follow a shot, there was drop off in the audio amplitude and a change in the timbre as well. While the former could be adjusted in post little could be done about the latter. For audio in the aircraft aloft Judy used the camera mic, which picked up an overwhelming amount of engine and wind noise. The combination of engine and wind noise in the older planes produced audio whose waveform looks like white noise. In retrospect, we should have use a microphone with better high frequency response to get better separation of cockpit sounds, and a mic blimp or similar heavy-duty windscreen. I worked with the cockpit audio in post, combining audio from portions of all three flights and greatly reducing the gain in order to get an engine sound that we were reasonably happy with. In retrospect, I'd probably have been better off using engine sounds from an FX disc. By placing her headphones on the camera mike, Judy was able to get some excellent aircraft-to-tower cross talk. All three pilots vetoed jacking the camera feed directly into their aircraft's headset outlet, which would have provided excellent audio, insisting that they wanted to remain in close contact with their passenger throughout the flight. Judy thinks they were afraid a 68-year-old woman might freak out during maneuvers and need reassurance from the pilots! She didn't. We decided to try to use the Star Spangled Banner recorded from the PA system to conclude the opening sequence of the DVD and Teri at the museum wrote for permission. Al McCree, President of Altissimo! Records gave the museum permission to use the U.S. Navy Band's recording without charge. McCree is a pleasure to work with and if you're ever in need of patriotic music played by U.S. military bands this is an excellent source. For the incidental Glen Miller WW II big band music played throughout the day on the PA system we substituted selections in post from Music2Hues' buy-out Swing collection. Finally, a nearly two minute section of the finished video is cut to a Scottish folk song played by bag pipers at the event. The pipers' music was recorded as a continuous clip, with deliberate moves of the shotgun microphone off-axis and to varying distances from the pipers in order to change the audio quality. I've written here before about using this technique, which creates a sense of "depth" or dimensionality in the audio. That is, clips from around the site can be thought of as near to or far from the stationary pipers, depending on the quality of the sound. It requires good headphones to obtain this kind of location audio, a must for every videographer's kit. And headphones are like seat belts: they're of no value unless you're wearing them! We returned to our studio with eleven hours of tape, and I sat down to edit. As I enter my 41st year of working in television and video production I have some strong convictions regarding editing. I believe that the primary responsibility of the editor is to tell a story, and to tell it in a compelling, well-focused, dynamic manner. More than anything else, what separates the professional from the amateur is the skill of the former in telling a story using moving images and sound. Although NLE encourages jumping right in and starting to edit, I'm persuaded that to create a story from hours of footage it is essential to log the tapes. There are at least two compelling reasons for logging. A well-structured log makes it easy to find material with minimum effort. More importantly, logging forces an editor to see the "big picture." It forces us to see the visual structures in each tape - that is, shots which can be combined in sequences which form a narrative unit -- and to see the possibilities for combining these units into a story of the event. Logging becomes increasingly important to the editor in direct relation to the number of tapes produced at a shoot and to the number of videographers shooting. Story telling goes beyond the "this happened, and then this happened" arrangement that often characterizes the so-called "journalistic" or "documentary" style of event videography, in which the camera is more or less turned on at the beginning of an event and turned off at the end. Back in the studio the editor takes out the wobbly bits, throws in lots of slow motion to smooth things out, adds some slick digital transitions and tops things off with some black and white special effects because "people love it" or "it really looks cool!" Story telling involves creating sequences of shots that provide narrative structure, rhythm and pace, surprise and discovery, and the opportunity for the viewer to become involved. Good stories progress from a state of tranquility to a state of turmoil and conclude with tranquility reestablished or, put another way, from low tension to high and back to low. This is as true in a novel such as Tom Clancy's Red Storm Rising as in film documentaries such as Alexander Sokurov's Russian Ark and Martin Scorsese's The Blues or in fictional performance works such as the theatre's King Lear and The Odd Couple and films like The Wizard of Oz, Calendar Girls and We Were Soldiers. Each begins at rest, then builds in intensity to a climax before releasing us to reflect upon the event of which we have been a part. Editing, through changes in tempo and rhythm, as often creates the climax as conflict, especially in documentary and reportorial works. The two most important elements in a film or video story, whether it's fiction, documentary or event, are the opening and closing sequence of shots. They frame the story, and inform us of how things are before the beginning and how they'll be after the ending. The opening sequence which culminates in the spoken word "Rosebud" and the broken snow globe, and the final shot of the sled being consumed by fire frame Orson Wells' Citizen Kane, for example, framing the journey through the life of Kane in the body of the film. Often opening sequences provide a metaphor for the entire work as well, as in the D-Day landing sequence that opens Saving Private Ryan or the nightmare smoke and fog of war with the surreally distorted "thump, thump, thump" of the half-seen helicopters at the opening of Apocalypse Now. I find in my own editing that before I'm able to create the opening sequence I must establish a viewpoint toward the material, a way of looking at the event whose footage I'm about to edit. Once I've done this and have created the opening the rest of the edit follows fairly easily. Establishing a viewpoint is crucial. Events are neutral, and a story may be told in many ways. What one story teller sees as serious - World War II prisoners of war in Stalag 17 or Escape from Colditz, for example - may be seen by another to be comic - Hogan's Hero's. It's the story teller or editor's viewpoint which imbues the event with meaning and emotion and which will determine how the story is developed. A recent competition among editors in the Seattle area illustrates the extent to which the editor shapes the video material. In a format similar to the WEVA "shoot outs," participating editors were given a twenty minute piece of raw video footage taken during a wedding photo shoot. The challenge was to edit this into a work of not more than five minutes duration, no other instructions given. Each editor was free to construct the narrative of his or her choice. Three editors chose to let the sequence of shots on the camera tape dictate the shape of their work, following the sequence almost to the letter, merely shortening or discarding shots until the five minute maximum had been reached. Of the remaining editors, one chose to craft a fairy tale about giants who carried magical flowers and wore funny suits and dresses (the wedding party,) a telling of the photo shoot as seen through the eyes of the little flower girl and ring bearer who were prominent in the raw footage. Another used the material to create a clever commercial for her company, while a third editor developed a satiric piece that spoofed the frenzy associated with a wedding photo shoot. Six editors, with four very different approaches to identical footage. I'm persuaded that the best editing is invisible, the kind of editing that Walter Murch does in Cold Mountain or Michael Kahn gives us in the opening twenty minutes of Saving Private Ryan. In a well-edited piece the viewer is virtually unaware of the editor's hand in shaping the story. Shots flow together because there is an underlying logic, an inevitability driven by the story telling that requires shot 25 to follow shot 24 and precede shot 26. Extraneous cut away shots, slow motion, the introduction of black and white sequences, digital transitions and extended cross fades and dissolves point away from the story and toward the hand of the editor. Finally, although video is a visual medium and sequences of pictures must tell the story, I'm persuaded that audio, and especially ambient sound, play an extremely important role in story telling. In event videography, audio is typically treated in one of two ways: where there is a person speaking it is synced to the video, as in the exchange of vows at a wedding, or it is dropped almost entirely and the video is covered with a music bed. Rarely is ambient sound used. In film, ambient sound plays such an important role in story telling that it is often created artificially in a Foley studio to reinforce the story line with authority and precision. Ambient sound is equally powerful and deserves the same attention in event video, where it can greatly enhance the telling of a story. Spending time on site before and during an event specifically collecting ambient sound is time well spent. And royalty free FX discs abound for use when ambient sound isn't enough. The sounds to be found on disc and on-line can be woven into a fabric of great depth and texture to contribute to or even substitute for an otherwise flat ambient sound track. Music may better serve us if we borrow a page from film and theatre, where music - significantly referred to as under scoring -- is used to provide emotional support to the ambient sound, the dialogs, the mood and the tension in each scene. Motivated music, music whose source we can see or infer - an organist, band, radio or television set, etc., -- serves the story better than a gratuitous music bed that has no link to the events we are watching. Inappropriately placed gratuitous musical passages, such as we often find in the film noir of the '40s and '50s, can be as humorous as the whinny of horses each time Frau Blucher's name is mentioned in Young Frankenstein. Like digital transitions, gratuitous musical inserts call attention to the hand of the editor and do little to further the story. And so, atop this four-decade accumulation of philosophical baggage, I sat down to edit the air show. Having logged them, I prefer to begin the editing process without reference to tapes or logs. Instead, I consider what my story will be about, how it will begin and end, what actually happened at the event, what it was that most impressed me. In retrospect, what struck me most forcibly at the air show was the peacefulness of the rural setting as we parked the car and walked to the air field, and later the noise -- the sounds, so different from one aircraft to another -- of planes and helicopters on the flight line and aloft. The obvious story to tell was of the three-hour flying show. But there was much more to account for: the grassy meadows, the heat, the dazzling sun and the towering white clouds; the noisy enthusiasm of the fair-goers, the static displays, the vendors and the air craft that were continually coming and going throughout the day. 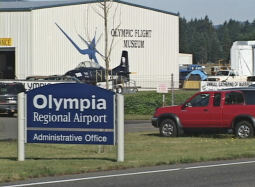 And so I told the story of a day in which the peaceful rural setting of the Olympia Regional Air Field is transformed into a flying circus. It's a story about walking and watching, about moving from exhibit to exhibit and looking, then standing and looking overhead while an aircraft performs before moving on to the next exhibit. It's about aircraft, their insignia, motors, interiors and unique profiles. It's about tranquility shattered by sounds from aircraft and loud speakers, by excited kids and their parents, by bagpipers and radios and the wind. The piece opens with a very wide shot of Mt. Rainier, some forty miles away, its glacial crown shimmering whitely in the heat waves; wind in the trees and birds chirping in the fields. Bird calls from an FX disc were added to enhance the ambient sound recorded on site. The roar of an approaching truck shatters this idyll as we cut to a close up of the road in front of the Olympic Flight Museum hanger. The truck passes between us and the hangers and is used as a wipe to a CU of the Museum and its sign. The fading sound of the truck motor segues into the drone of a P-51 approaching the airfield and we cut to the P-51, seen against the backdrop of Mount Rainier and banks of towering cumulus clouds, and watch it land and taxi to join a queue of arriving planes, providing an opportunity to see nearly a dozen aircraft as they taxi to their parking assignments. Each plane provides its unique sound signature, adding to the cacophony on the flight line. As the scream of the last plane, a Mig-17 jet fighter begins to die away, we hear in the distance the whine of a helicopter taking off and cut to a man walking toward the camera, walking away from the now parked P-51 seen behind him. The helicopter grows louder and we cut to the reverse angle of the man as he moves toward the helicopter ride area and a sign in the foreground that says "Heli Rides." The viewer experiences the day of the air show with very little intrusion of video technology. Two conventions introduced in the first two minutes of the 50-minute DVD are used throughout the piece. Shots of walking spectators create a moving transition that carries us from place to place on the event site. The walking spectator also creates "point of view," enabling cuts to shots of what the spectator presumably sees before him. Each time one narrative segment ends - a sequence of shots of aircraft on the flight line, for example -- a shot of walking spectators is cut in to carry us to a new locale, or to focus our attention elsewhere. This is reinforced in the audio by a "J" and "L" cut. Audio that begins in sequence 1 (e.g., an aircraft engine idling on the flight line) continues under sequence 2 (the walking spectator) and fades out as the audio from sequence 3, voices in a flight crew briefing, fades in toward the end of sequence 2. The briefing dialogs continues as we then cut to the video for sequence 3 and see the briefing in progress. These conventions are designed to affect the viewer in two ways. The walking spectators create anticipation: "Where are these people going; what are they looking at? What will they see next?" the viewer wonders. Similarly, the "L" cut introduces an element of suspense -- "Where is that voice coming from?" - and fulfillment when we see or infer the source. In addition, the overlapping "J" and "L" cuts contribute to a realistic sense of movement through the site - we've been here and it sounds like this, now we're leaving the sounds of this place behind and moving toward something new, whose sounds grow louder as we approach. By establishing these conventions early, I was able to avoid using digital transitions and to minimize the use of dissolves. The cohesiveness of the story emanates from the "characters" in the story - the spectators at the show -- as they move through it. The conclusion of the Air Show DVD reverses the opening, with a pair of FM-2 "Wildcats," which have been freeze framed behind sponsor credits, coming to life and flying out of frame, the sound of their engines receding in the distance. Tranquility is restored. The story of this day is complete, come full circle. Large-scale events provide a wonderful challenge to the videographer, testing craft and artistry, patience and stamina. Along with organizational and people skills, imagination and improvisation, grace under fire is a must. For us, this kind of work is challenging, exciting and fun, which is what we believe the profession is all about!